The City of Cannon Beach limits us to one guest rental every 14 days, so East Wind has limited check-in and check-out dates. You may use the online booking function to make a reservation, or please call the CBVR Office at (503) 436-0940 if there are questions. Thank you! When the breezes blow you into town, there’s no better place to land than this brand new super sized studio in the quiet, peaceful Tolovana neighborhood. Locals cherish this uncrowded stretch of beach for walking, meditating and beach combing, and you’re just 100 steps from home to the sands! Fresh, springy décor welcomes you to kick off your shoes and relax; either to run outside to play or cozy up in front of the gas fireplace to read or watch a movie.. the flat screen TV swivels for sofa watching or nap time nodding.. and you’ll always enjoy catching a sunset as you take in the ocean views through the neighborhood, from inside and out. Open your windows in the evening and drift off to the signature sound of the ocean’s roar; there’s no sweeter way to be lulled to sleep, or awakened, than the fresh salt air and sounds of the Pacific. Use the adorable, well stocked complete kitchen to brew up your morning coffee or make an entire meal, but don’t miss your chance to settle on the porch, listen to the waves and reconnect with nature, right at home. 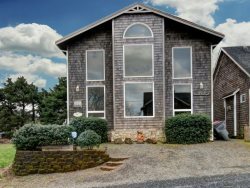 East Wind is one side of a completely rebuilt duplex and while it is all new, you will find that the charm and character of this quaint Cannon Beach home remains.